As a hostess gift, new baby gift or centerpiece for a casual coastal soiree; this charming preserved centerpiece tempers heat and humidity with a cool, clean palette and inviting cottage-chic aesthetic. 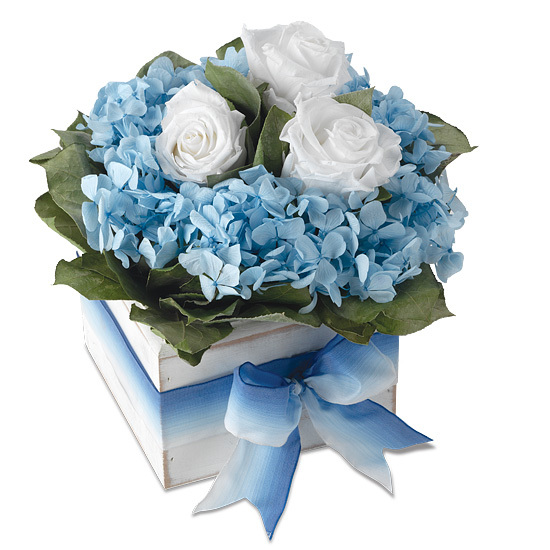 Features white roses, light blue hydrangeas and natural lemon leaves in a whitewashed wooden box with a bow of ombré blue French ribbon. Gently weathered edges add interest and easy-going personality.